This model has been discontinued. Click here to see other DeLonghi Stand Mixer Accessories. For use with DeLonghi DSM7 Stand Mixer. 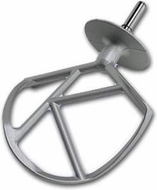 The K Beater attachment is perfect for mixing cakes and pastires, or combining ingredients for your favorite recipes.